CACFP reimburses participating centers and day care homes for serving nutritious meals. It is administered at the Federal level by the Food and Nutrition Service (FNS), an agency of the U.S. Department of Agriculture (USDA). The Iowa Department of Education administers CACFP in Iowa. The State agency approves sponsoring organizations and independent centers to operate the Program at the local level. The State also monitors the Program and provides guidance and assistance to ensure requirements are met. 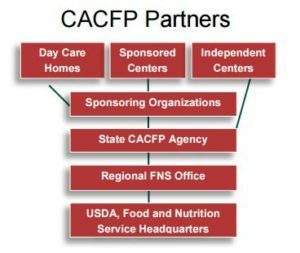 Sponsoring organizations play a critical role in supporting day care home providers and/or centers through training, technical assistance, and monitoring. Several types of organizations are approved by the State agency to serve as home or center sponsors, including community action agencies, nonprofit organizations, public agencies, and churches. Centers may operate independently, but all day care homes must come into the Program under a sponsoring organization. 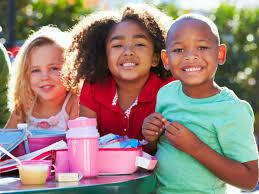 CACFP is the Child and Adult Care Food Program, a Federal program that provides reimbursement for serving healthy meals and snacks to children and adults receiving day care. Each day more than 3.2 million children and almost 112,000 older adults participate in CACFP. Through CACFP, participants’ nutritional needs are supported on a daily basis. The Program plays a vital role in improving the quality of day care and making it more affordable for many low - income families. In addition to day care, CACFP helps make after school programs more appealing to at - risk children and youth. After school centers that serve meals and snacks draw students into constructive activities that are safe, fun, and filled with learning opportunities . Children who are homeless or from temporarily displaced families can also receive up to three meals each day through emergency shelters that operate the Program. Adults age 60 and older enrolled in an adult day care center and functionally impaired adult participants in day care or emergency shelters. Breakfast requires of a serving of milk, fruit or vegetable, and grains or bread. 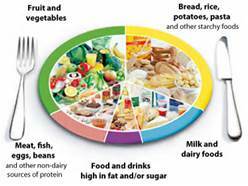 Lunch and Supper require milk, grains or bread, meat or meat alternate, and two different servings of fruits and/or vegetables. Snacks require two different servings of the four components: milk, fruits or vegetables, grains or bread, or meat or meat alternate. Infants follow a separate meal pattern. Many different facilities operate CACFP, all sharing the common goal of serving nutritious meals and snacks to participants. Child Care Centers Licensed or approved public or private nonprofit child care centers, Head Start programs, and some for - profit centers serving meals to large numbers of low -income children. Day Care Homes Small groups of children receive nonresidential day care in DHS registered private homes. “At -Risk” Afterschool Care Programs Centers in low -income areas provide free meals and snacks to school -age children and youth. Homeless Shelters Emergency shelters provide temporary shelter and food services to homeless children. Adult Day Care Centers Public, private nonprofit, and some for -profit adult day care facilities provide structured, comprehensive services to functionally impaired nonresident adults.